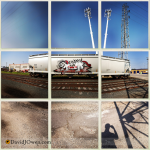 Blue skies, crazy “skate rat” graffiti on a train car, cell tower, power lines, cracked pavement and more. A great scene for a checkerboard panoramic! 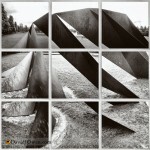 One of the early checkerboard panoramics was made at the Walker Art Center’s Sculpture Garden. Charles Ginnever’s “Nautilus” is another favorite piece of mine, so what better way to get back to posting these checkerboard panoramics than this?